Well, never say never! 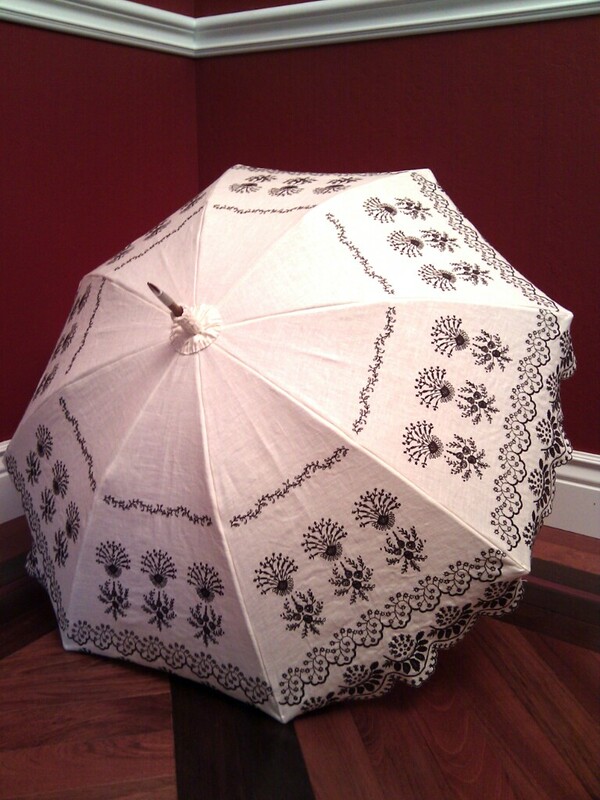 In my previous post (Restored Parasol, c. 1900), I mentioned that I hadn't seen extent parasol canopies with a "skirt" like I put on the canopy of that parasol. 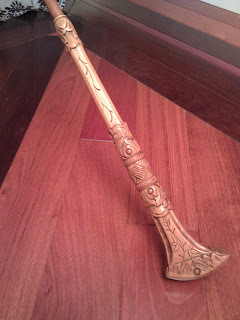 Now I have, and on two antiques from my own collection! Extant canopy from another 1870s parasol. The fabric is something like silk taffeta. Both these frames are from 1870s or later (they have metal ribs, so it's not likely that they date to earlier than the late 1860s, at the very earliest). The frames both happen to be folding frames (also called carriage frames) with tilt hinges. 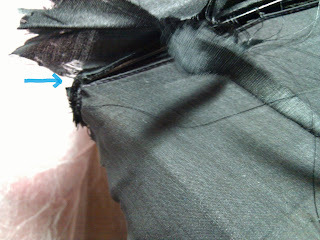 The canopies are prototypical: black silk, with pinked edges, lined with something like china silk. The silk is shredding to bits, of course, so eventually the canopies have to come off and be replaced. The first canopy has a tiny skirt, extending only about 1/2 inch past the tip of the rib. The second has a slightly longer skirt, about 3/4 inch past the rib top. On the first, the rib tips are wrapped with thread, which has kept them from punching through the canopy fabric (this was hard to photograph, because the lining is in the way). The second doesn't have anything on the rib tips, so they've worn through the fabric in a few spots. way. The blue arrow indicates where the rib ends. The canopy extends down from there about 3/4 inches. There's nothing like a deadline to get you hopping on a project, right?? I needed a parasol for an outdoor event today...then, of course, today was completely overcast and verging on RAIN, so the parasol stayed home. Poo. 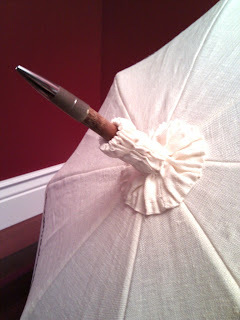 Ah well, at least the parasol is now DONE. 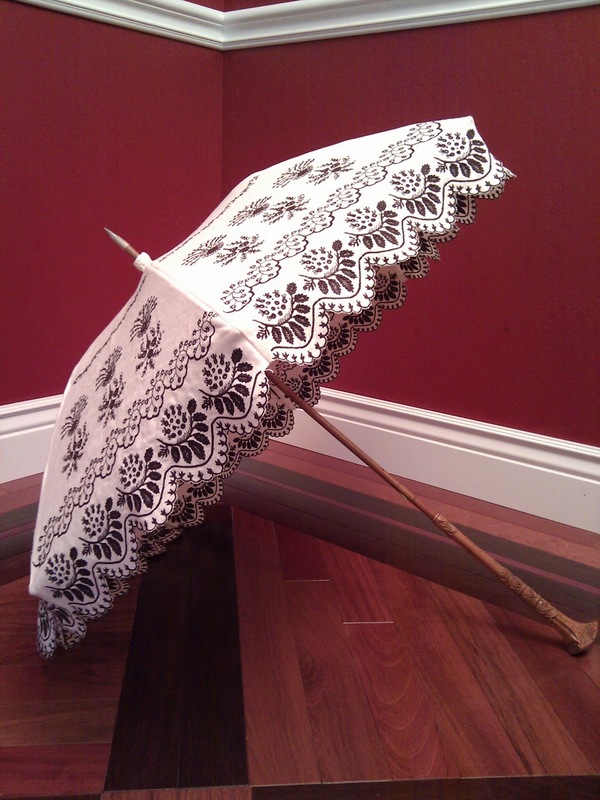 This parasol's canopy was originally the subject of this earlier post I wrote, outlining the process of doing a large machine embroidery. The base fabric is medium weight linen, and the embroidery is cotton quilting thread on top, polyester sewing thread underneath. I bought the frame a number of years ago, and it came to me completely bare, except for the disintegrating remnants of silk wrapping that padded the spreader joints. 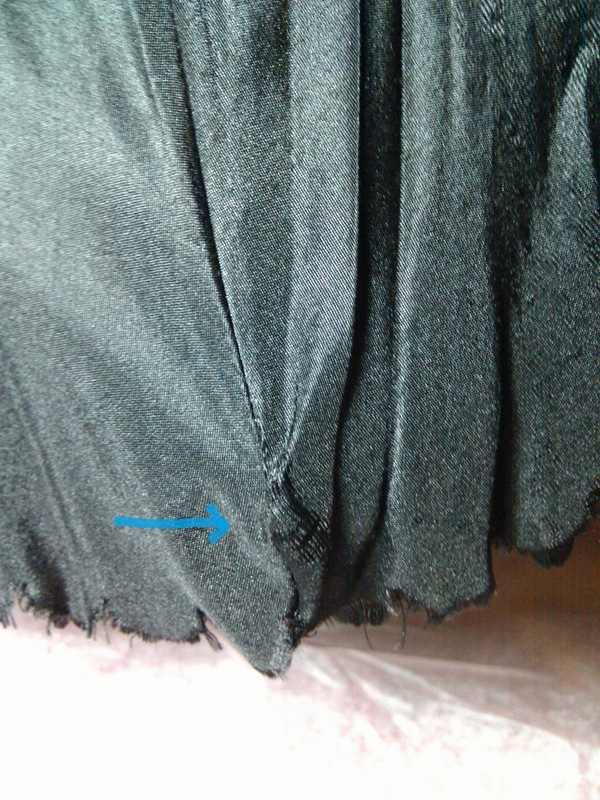 These I removed and replaced with scraps of linen from the canopy. The frame also had rust around the top, and a little at the rib tips, which I painted over, partly for aesthetic reasons and partly to avoid the rust from spreading. The handle is some mystery wood and the shaft is a single piece of bamboo. Since I was in a rush, I was just going to finish attaching the canopy and use the parasol. Buuut I couldn't leave well enough alone, so I also finished the "rosette" above the slider, and the "scrunchie" around the finial (I've made up those terms; I don't really know what they would've been called for real). In reality, the most challenging part of restoring this parasol was that it was missing the cap that parasols often (but not always) have at the top of the finial. I sacrificed a slightly expensive (but real metal) pen to make this final cap. I'd like to find a better solution, but for now, this will do. The parasol's handle didn't need any work. I cleaned it, back when I bought the parasol, with some wood furniture cleaner, but have otherwise left it alone. So what's with the date of this parasol? It's really challenging to pin a parasol to a precise year, let alone an exact decade. 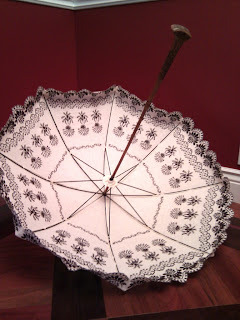 There are a number of factors that one can use to establish a date (such as the rib construction, the style of spanner joints, the overall length, and the size and shape of the canopy), but when it comes down to it, there was never only one style of parasol in existence in any given year. Sure, there may have been a general look that was in fashion, but within that look there would have been plenty of room for variation, and who's to say that someone didn't offer styles that were just not in fashion It's not like the 1890s or 1910s had only ONE style of shoe. We know that just wasn't true. Anyway! By my estimation, this parasol might have been built anywhere from 1890 to 1910, so I've labeled it with a date smack in the middle. 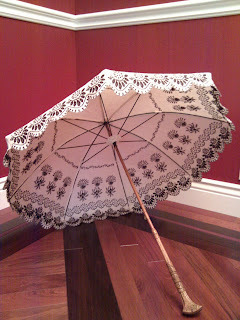 Lastly: what have I learned from restoring this parasol? First: the canopy is heavy. All the surviving canopies I've seen that aren't silk or lace have been fine, light cotton. Next time I do a canopy like this, I'll use cotton instead. 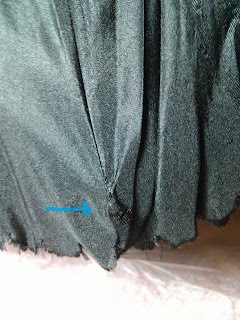 Second: the "skirt" around the edge of the canopy doesn't really work. 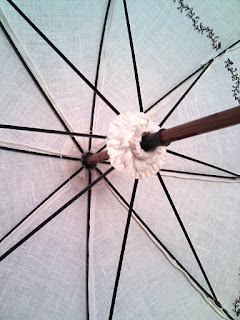 It tends to flip up when I open the parasol. 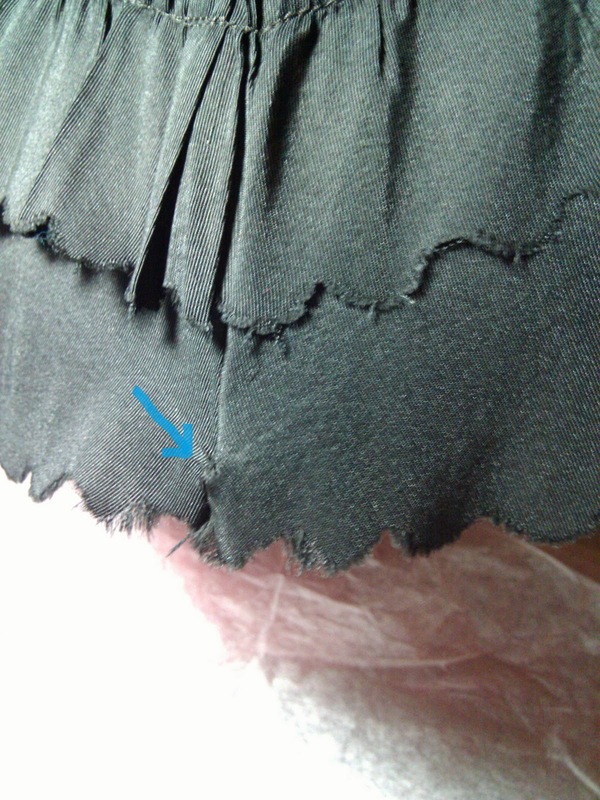 I honestly don't think I've seen a skirt like this on a surviving canopy; skirts tend to be cut in crescents that leave the rib tips exposed. Now I think I know why!